This is one of the more difficult, and stressful, situations a student can find themselves in. For whatever reason, you have just one week to prepare for the Miller Analogies Test. If you know anything about the MAT, you probably know how broad the information tested in this exam is. However, even though the MAT can create analogies using anything from obscure vocabulary to history trivia, there is a lot you can do to prepare for the exam in a short period of time. To help make the most of your time, we have created a 1 week Miller Analogies study plan. Our first focus is to get you familiar with the test format. The MAT is comprised entirely of analogies, and you need to get in the habit of using analogical thinking. That means a lot of practice questions. We want to get you used to applying analogical thinking to the vast amount of information you have gained in college (it’s probably more than you think!). Second, you need to learn the right strategies for answering a MAT question. Strategy and good pacing will really help you on test day. Lastly, you want to select a couple areas where expanding your knowledge might allow you to get a few extra questions right. It does not take much to improve your score on the MAT; an extra 4 or 5 correct answers can improve it substantially. Magoosh GRE Flashcards – they’re free and offer a great way to learn new vocabulary anywhere since they can be downloaded to your computer or mobile device! A notebook – any kind will do. Official Miller Analogies Practice Test – each one will cost you $30 (you only need one). They’re expensive, but—if you can afford them–they provide the closest material available to the actual test. Moreover, they feature more complex connections than what you will find anywhere else. If you want to know exactly what type of questions the MAT considers challenging, this is the best source. Read both the entire MAT study guide and the first chapter of the Kaplan study guide. These two resources are going to go over largely the same information, although the official guide will cover more about the types of analogies that are on the MAT. You do not need to memorize the different types, but you should have a general idea of what they are. Feel free to take notes on anything that seems useful. I cannot emphasize enough how important the question answering strategy mentioned in these guides is. For every analogy, you will always follow these steps first: identify the relationship between the three given terms, think of a fourth term on your own, and—after coming up with your own term—look at the answer choices. This is your go to strategy for the MAT. Every single question you practice for the next seven days should be done using this strategy. If it doesn’t work, you can move on to other strategies (like working backwards). But start here every time. Next, take the diagnostic exam offered in the Kaplan guide. Remember, never write your answers in the textbook (use the notebook), and always take practice tests under a 60 minute time limit so that you learn good pacing. Also, you can give yourself scrap paper to use for whatever you want (you will have it on exam day). Once the diagnostic is complete, score your exam. As you score, pay attention to your incorrectly answered questions and the reasons why you got them wrong. If you did not know the terms being used in the analogy, simply read the answer and think about how the analogy now makes sense. BUT if you knew the terms and still answered the question incorrectly, write down the question number. Do this for the entire exam. In theory, if you know the definitions of all the terms in an analogy and you still get the question wrong, you must have missed the connection being made. Each day, you should return to the previous day’s “missed connection” questions and try to solve them again. Obviously, you might remember the right answer. But focus on trying to see and understand the connection. 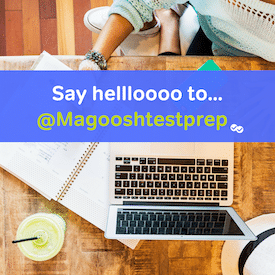 *A note on using the Magoosh flashcards. These can really be used whenever you want. You can use them to break up other studies or save them strictly for moments when you are out of the house. First, go over your missed connection questions. Next, take another Kaplan practice exam (do not write in the textbook) and score it as you did yesterday. Read the answers and take down the numbers for any “missed connection” questions. At this point, you should have a pretty good idea of where your weaknesses are. But on the MAT, your weaknesses could be a pretty broad list: art history, music, math, vocabulary, etc. The reality of studying in just one week is that you do not have time to study all of these areas. Moreover, many of them are not suitable to study at all. For example, to get the famous artist questions, you need to know the artist’s name, artistic movement, and the time period they worked in. This is simply too much information to learn for every artist. Many areas of knowledge on the MAT are like this: too much information to learn in a week. To simplify things, pick one of these two areas to improve in: vocabulary or math/science. Pick which ever one you are weaker in. You can use Kaplan (which has a word list) and the flashcards to study vocab. Math/science on the MAT tends to be very basic. You often only need to learn the definitions (similar to vocab) to be able to answer the questions. The MAT is a big fan of metric measurements, geometric shapes (name a polygon with five angles), and latin/greek measurement prefixes (centi-, milli-, etc.). This information will normally be ten terms or less and easy enough to memorize in “cramming” fashion through flashcards. Kaplan also has premade lists for this information as well. Pick an area, and use flashcards to study. You are going to repeat the steps from Day 2 (Day 3 is a good day to use the official practice test if you purchased it). Each day, go over the previous day’s “missed connection questions,” and take another practice test. Again, always practice the strategies you learned in the study guide and the Kaplan introduction. If you do not practice them now, they will not be there for you on test day. Finish each day with practice in either vocab or Math/Science. Studying for anything is exhausting. Try to take it easy your last day. Instead of doing a practice test, focus mostly on going over the test strategies and reviewing your incorrectly answered questions. Most importantly, make sure you get a full eight hours of sleep the night before the test. Do not stay up all night trying to learn any more information. You need to be well rested for your exam so you can access all the information you have learned this week. So relax and be proud of the hard work you’ve put in. I only have one week to prepare for the MAT. What do you recommend? Well, this one week study plan is a good place to start. ;) What other specific recommendations would you like, Gayle? This looks like a solid plan. I have a week and a half — but I purchased Mcgraw-Hills MAT guide (10 tests, strategies, and lots of names and terms). Would this be a suitable stand in or does the Kaplan book have a better set up? How many hours at a time or per day do you think is necessary to spend while following this plan? Hello today I took my MAT exam and made a 375 needing a 400. I used the McGraw-Hills book, but was wondering how helpful are those test you provide for $30. Studying for this test isn’t exactly hard honestly it feel like there is no way just because anything can be on the test. Just to be clear, we don’t provide any MAT materials; we are advocating the use of the official ones. The best source of practice for tests will always be authentic materials, which is why we recommend the $30 tests. They are only helpful in that they are authentic, though. They don’t offer you a bunch of additional instruction or information.